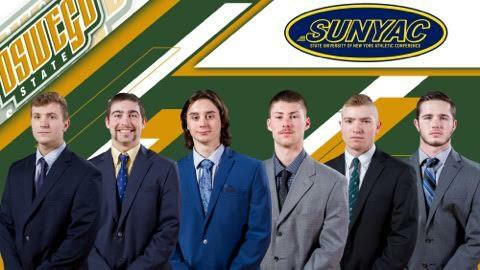 Six members of the Oswego State men’s lacrosse team have earned All-Conference honors from the State University of New York Athletic Conference (SUNYAC), including Adam Burlew of Thiells. Kevin O’Donnell was named the conference’s Rookie of the Year. Teddy Phillips was named to the first team, Adam Burlew, Bobby Emerson and Tim Schof collected second team honors and Kyle O’Connor received an honorable mention. In his freshman year, O’Donnell was a force to be reckoned with in the net for Oswego, starting in all 15 contests. The goalie recorded a 10-5 record on the season, and his 66.7 win percentage was good for the top spot in the conference. Nationally, O’Donnell’s goals-against average of 7.85 and save percentage of 0.57 both earned him spots in the top-50, placing him 37th and 47th, respectively. The Cleveland, Ohio native played one of his best games of the season against St. John Fisher College on March 17. Making 11 saves and allowing seven goals, O’Donnell helped the Lakers to their first win over the Cardinals since 2005 and earned the SUNYAC Goalie of the Week honor for his efforts. This is the second consecutive year a Laker has earned the Rookie of the Year title, as Schof received the honor last season. Phillips, who was named to the All-SUNYAC second team in 2017, earned his second All-Conference award of his career with his first team accolade. The defender’s 22 caused turnovers ranked him first on the Lakers – for the second straight year – and placed him in a four-way tie for second in the SUNYAC. Philips was also crucial in collecting ground balls for Oswego, scooping up 39 to trail only O’Connor (55) for the team-high. The senior’s lone shot of the season was on-target, as he scored to help Oswego to a season-opening 13-8 win over Hartwick College on March 3. Burlew, also a senior, earns his first career All-Conference honor with his second team nod. Wielding the short stick, Burlew collected 31 ground balls for Oswego to put him in a tie for fourth place on the team with Seamus Burns. The Rockland native played in all 15 games for the Lakers, helping Oswego stifle its opponents’ offenses. Oswego allowed opponents to score 10 or more points only three times during the season – first against then-No. 16 Ithaca, next to eventual SUNYAC champion Cortland and finally in a 13-10 Senior Day win over Potsdam. Emerson was named to the second team as well, earning the honor for the second-straight year. The junior finished the season with 27 goals, good for second on the team and seventh place in the SUNYAC. Emerson was particularly strong in taking advantage of man-up situations. His six man-up goals put him in first among the Lakers and second in the conference. The Lake Grove, N.Y. native earned two weekly conference awards during the season, first with an eight-point week over two games for the week ending April 1, and later with a seven-point week across two victories for the week ending April 22. Rounding out the second team honorees is Schof. Schof notched a team-high 23 assists on the season, which earned him third place in the SUNYAC. The sophomore was especially effective in dishing out assists during conference play, as his eight assists against SUNYAC foes ranked him second in the conference. Starting in all 15 games on the season, Schof also contributed nine goals to the Lakers’ efforts. Faceoff specialist O’Connor earned an honorable mention for his performance at the X this season. The sophomore was successful in 161 of his 289 faceoffs, for a win percentage of 0.56. His 161 faceoff victories ranked second in the SUNYAC, as did his 58 successes in conference play. Additionally, O’Connor scooped up a team-high 55 ground balls on the season. As a team, the Lakers finished the season with a 10-5 record, their most wins since the 1996 season (12-3). Oswego also earned a spot in the SUNYAC Championship for the first time since 2009.